Rory Skinner will make his Pirelli National Superstock 600 debut from second on the grid after narrowly missing out on pole position during today’s qualifying session at a hot and sunny Knockhill circuit in Fife. 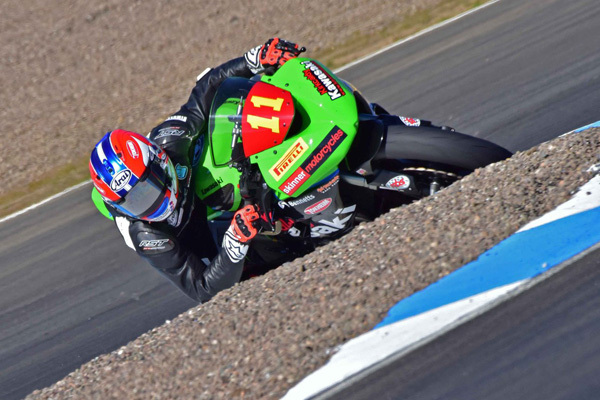 The 16-year-old Perth rider immediately got down to business on his Bennetts Tokheim Kirkcaldy Kawasaki ZX-6R, going under the class record with a time of 50.550 seconds on his sixth lap, to take the provisional pole position in his first outing in the class. Mid session saw Rory nudged back to second by championship leader Ryan Vickers, who posted a lap time just over 0.1 seconds faster, and although the Scottish racer was able to string together a run of consistently fast laps, a combination of heavy traffic, waved yellow flags and diminishing grip levels, combined with a small mistake, meant that he was not quite able to take pole for his first ever British national championship race. “I’m happy with that,” Rory said after the session. “I tried to go for pole right at the end but I ran a little bit wide and I knew when that happened that my lap had gone and that I wouldn’t be able to go any faster. Tomorrow’s 22-lap race is scheduled to take place at 12:35, with highlights shown on British Eurosport 2 on Monday night.